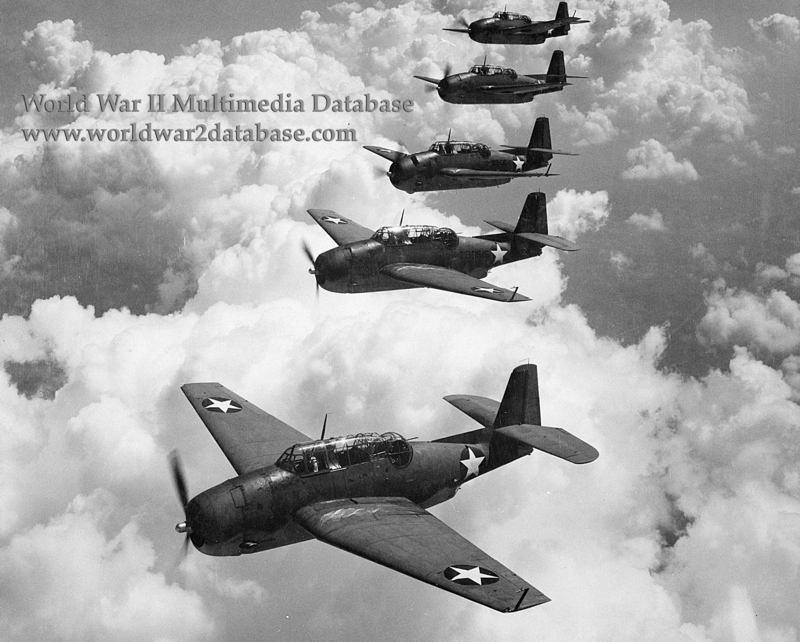 Grumman TBF Avenger torpedo bombers of VGS-29 during a flight from Norfolk Naval Air Station. VGS-29 was established on May 20, 1942. It trained at Norfolk until October 1942, when it shipped aboard USS Santee (CVE-19) to provide air cover for the invasion of French Morocco. Between escorting convoys to Casablanca on Santee, VGS-29 was based in Brazil conducting antisubmarine patrols. The squadron was redesignated VC-29 on March 1, 1943. After torpedo training, the unit was sent to the West coast and then Pearl Harbor for more training. Assigned to the USS Cabot (CVL-28) in October 1944. Over the next seven months, they attacked targets in the Philippines, Vietnam, China, and Japan and played a major part in the Battle of Leyte Gulf. US Navy Lieutenant Howard H. Skidmore, a talented pilot, was one of the top scoring pilots of VT-29. After leading the attack on IJN Musashi, he survived two kamikaze strikes in five minutes on November 25, 1944 on Cabot as he was waiting to take off, which destroyed his plane. He earned the Distinguished Flying Cross (2 stars, meaning he won it three times) and many other awards, including VT-29's Presidential Unit Citation. VC-29 was redesignated VT-29 on December 1, 1944. On April 1, 1945, during the invasion of Okinawa, Skidmore made the only known successful takeoff from the catwalk next to the flight deck. VT-29 was disbanded on August 1, 1945.